Hello everyone! Omens of the Past has been out for a week now, and I’d like to bring you my list of cards I really like and cards I really don’t. Most of these will not be for power reasons, but flavor, gameplay, or other miscellaneous concerns, so please don’t confuse this with a Top 10 list. That comes later, once the set is more established. For now, it’s just stuff I really liked or really didn’t like, so let’s get to it! This card hit a lot of notes I liked – it’s not overcosted or understated, it has a powerful reusable effect, and it does its thing the turn it comes in. I also like that it’s aggressively bent – usually these kind of cards are defensive in nature, emphasizing a controllish playstyle, but this is flexible enough to top end some kinda Lifeforce aggro or help Midrange reload. It’s also mono Time, so you can splash it in a number of decks. I’ve had fun with it and Stronghold Visage already, and I look forward to seeing a lot of it in the future – it’s a different kind of Mystic Ascendant. I glanced over this card at first, but on the third read something stuck. I tried this out in a silence light deck as “just a silence” with 4xLevitate as backup, and boy did it overperform. There’s a ton of annoying flyers charging around (Makto, Reaper, Soulfire Drake) that this answers incredibly cleanly, and it combines with Levitate to kill anything. That’s a lot of flexibility for a card with the fail state of being a fast speed silence, which Desert Marshal has shown is plenty disruptive on its own. This is going to be a sideboard card at worst – it does a ton of work if the targets line up, and it’s efficiently costed. Hey, its another removal spell. Clean cards are always big hits, and this has 5 words on it including name and typeline. Slay just feels incredily satisfying to play, and you’re rarely trading down on power. It’s efficiently costed enough that both aggro and control are interested and splashable enough that it could pop up in lots of different decks. I much prefer getting these kinds of cheaper, situational options to fifteen Feeding Time varients. 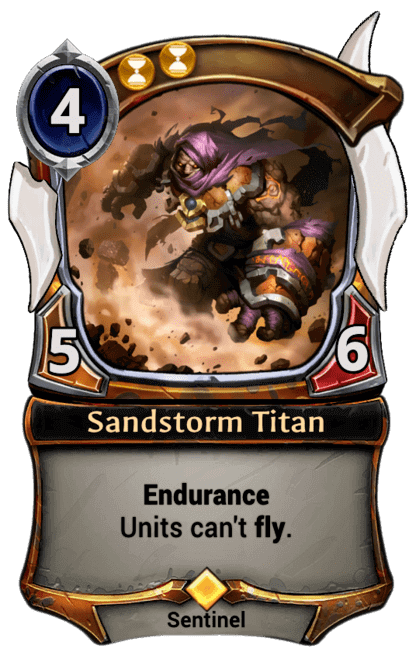 Remember Sandstorm Titan’s scarf? Groundbreaker’s “can’t gain life” effect is way cooler, and the card itself is really strong. It’s also nice that its heavy fire, so it’s pushed more into decks that have harder times enabling it on curve. It’s funny (to me) that Titan is an off switch to flyers, well Fire now has an off switch to Time’s Lifeforce shenanigans. Time still probably has the better of the trade though. At least this isn’t legendary! I just love this guy, probably more than I should because I’m putting him in decks. He rolls the dice on a keyword, then hands it off to whoever can best use it – how cool is that! It’s just battle skills, so there’s lots of useful stuff you can get – Aegis, Charge, Revenge all come to mind. That said, its a pretty random card and probably not consistent enough for serious decks. Probably good that he doesn’t hand off ALL his keywords – don’t really want Crown to break again. This card has sweet art, incredible flavor, and plays well. Opponent’s don’t expect you to be playing your units into your own Harsh Rule – jokes on them. The unit can’t attack that turn, but its usually not a big deal. 7JJJ isn’t out of the realm of high curve midrange decks or control decks, both of which could potentially make good use of curving a strong six drop unit into this. Shadow gets relic disruption! This plays the defensive game, snatching key cards from your opponent’s hand and playing a deadly defense. I like seeing these kinds of maindeckable tech cards – narrow hyperefficient hosers are all well and good, but they’re not exactly maindeckable in bo1 ladder. Wider range cards like this are much more effective. It’s also nice to see Shadow reinforcing its identity re: relics – it deals with them by discarding them. It’s just Torch stapled onto Silence (plus a one cost markup) but boy is this card cool! It also uses the Retribution art, which is great because it means Retribution probably isn’t coming back. That card sucked. It nice to give fire some more flexibility in identity, funneling Praxis into pure midrange or tokens wouldn’t have been very fun. Plus, this is nearly the only card that’s clearly two existing cards stapled together that I haven’t seen IlyaK complain is overcosted because it costs more than sum of its parts. Yet, anyways. I always read Decimate as “Kill this player in particular”. Forget scaling Flame Blast or card drawing Channel the Tempest. This is commitment to leaving scorch marks where your opponent used to be. Only seriously dedicated players are going to put a 10 cost card that can only target players in their decks. Yes, I’m aware that you can point it an units, in theory. But lets be real here, if you’ve reached the point where Decimating a unit is your only out, you’re either going to emote BWAHAHAHA while you Decimate their face anyways, or BEHOLD MY AWESOME POWER while you commit honorable Decimato. Forget Aid of the Hooru, this is a 12 drop! The text clean-up fixes a lot of the initial confusion of the card, and there’s very few boards this card won’t stabilize. This is pretty similar flavor (in my mind) to Last Warrior style cards – when he shows up, everyone else dies. He’s also one of the biggest fatties in the game, and would be a prime reanimator target if he didn’t have the incredibly awkward “can’t leave the void” clause. It didn’t look good on Excavate and it doesn’t look good now. Is it so bad to have an exile zone or something? If you don’t want them to go to the void, put em somewhere else. Hell, put him on the bottom of your deck, that’d be cool. The Spirit of Resistance never dies! Plus, silences mean he can leave the void. Unless DWD patch the “can’t leave the void” text as unsileneceable, in which case we dig an extra level deeper in heavy handed no-you-can’ts. Please don’t go down that road. This was the card that inspired the “Lows” portion of the list, it’s actually impossible for me to get through a conversation about Hooru without complaining about it. Don’t get me wrong, the card itself is great – early game unit with late game applications is everything control, midrange, or even aggro could hope for. It’s basically Hooru’s Bloodcaster, except it will probably be even more ubiquitous than Bloodcaster because of costing 1 less and an easier influence cost. And that’s where the hate comes in. The unit doesn’t do anything interesting, it’s just a fine 2/3 endurance for 2 that turns into 6/7 worth of flying stats in the later stages of the game, which is too good to pass up. Odds are Kothon is going to end up being a 4xautoinclude in Hooru decks for some time to come, which just artificially raises the bar on getting into Hooru since it’s not like you’ve got lots of other 2 drops to fill even the effective early blocker role. Borderlands Waykeeper? I hate that you’re basically priced into crafting 4 to play most builds of Hooru seriously, even if that overhead cost may not affect me personally. My dislike for this card smoulders far milder than my hatred of Kothon, but I’ve been complaining about this one since it was spoiled too. It’s just a stat check 4/4 for 3 – no keyword, just a solid rate on stats to cost. Sound familiar? I figure the Fire part would be basically flavor text in a majority of games – you’re very rarely going to get FFFTTT early, and when you only have FFF there’s not a ton of boards where you can safely attack with a 2/2. I don’t think this card is broken or anything (it’s way worse than pre-nerf Champion of Chaos) but Champions are sort of the flagship cards for the faction pair, and I wish this one was more interesting than a midrange stat ball. Okay, it’s bad. Comically so. You need a 2/2 to survive an entire turn, with huge influence requirements to get… two 4/4s, best case. By the time you’ve got all that influence, Grand Parliament is generally playing two owls anyways, and those at least fly. This could probably be a 3/3 to at least make the dream worth reaching for. Oh well. That’s not really where the hate comes in. Champion of Progress is a card, even if we don’t talk about it. The thing that REALLY grinds my gears about this one is… I opened EIGHT copies in my first set of packs. It was quite literally half of my set-wide duplicates. I’ve since opened several more copies and am halfway to a premium collection. I know packs is the only time I’m gonna see ya, but could you maybe write a letter or something instead of showing up unwanted twice a day? Here’s a theme – bad cards! Two power and replacing itself is a big ask, which is a huge shame because I loved Inspire. In fact, they go in the same deck, and that’s where the problem starts. Between Inspire, Temper, and Tinker, you’re able to fairly reliably use spells to buff up the card of you choice by including no other targets whatsoever then tutor up the buffed unit/weapon with Rise to the Challenge to crush your opponent in one or two turns. This playstyle is a cool example of what you can do, but Tinker is a horrible horrible card that basically prevents them from printing COOL cards with psuedo-warcry, because if the spell-warcry density gets too high… The deck is going to be really annoying to play against. Here, I take a moment of silence to mourn the design space that was lost. Can we rename this Rolant’s Finger, because that’s what it feels like he’s giving me when I see this card. What am I supposed to do with this? Its a gigantic weapon with no keywords and text that ranges in effectiveness from “constructive staple” Passage of Eons to useless. It competes at the very same mana cost with Awakened Form, which has the benefits of fast speed, being immune to attachment removal, and being a permanent boost. This is probably a story card, but I’d very much like to see the story because right now its just Rolant’s Finger. Like, at least give them -2/-2? Fast speed? No? Okay. Probably not a constructed plant. Look at that smirk. He knows what he did to interactive games. Unblockable + Aegis is one of the most obnoxious combinations in the game, preventing both spells and traditional unit combat. If Relic Weapons and Killer aren’t in vogue, “Bart” is going to be very obnoxious to play against. And now we come to the meme card! Except… it’s apparently not? Drawing two cards a turn is a powerful ability, even if you’re now drawing from a random deck instead of your own. It’s been noted that this does essentially nuke all your power, so you’re basically guaranteed to be drawing stuff to cast, although of course there’s a pretty high density of chaff you can get as well. This also keeps your hand intact, so you can hold onto some key card if you want to, and it’s fine in multiples – it either gets rid of itself or you’re drawing even more cards a turn. I’m not sure where I stand on such a random card being a potential real deck – surviving to cast this and then drawing a few good cards might be a real thing. I don’t know if that’s a good thing or a bad thing – if this ever approaches being “the optimal line” we’re probably in deep trouble. 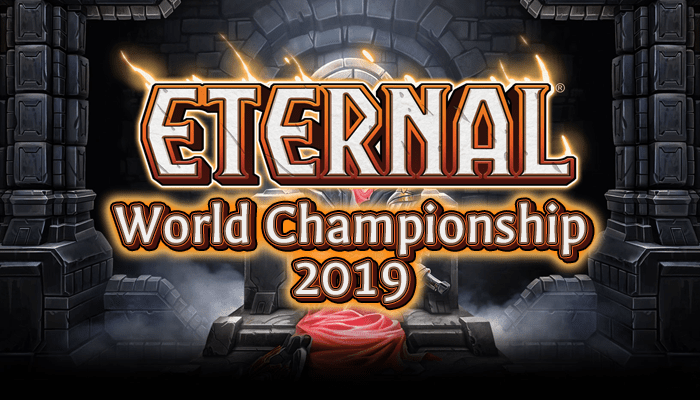 Previous Post: Announcing two new Sunday Tournaments!